The National Health Information Sharing and Analysis Center (NH-ISAC), is a global, non-profit, member-driven organization offering healthcare stakeholders a trusted community and forum for coordinating, collaborating and sharing Physical and Cyber Threat Intelligence and best practices. They have two Summits a year. Gurucul has been a NH-ISAC partner since the inaugural event in 2015. We were pleased to sponsor the 2018 NH-ISAC Spring Summit held earlier this month. And, we will be at the Fall Summit in San Antonio, TX in November. The event kicked off with a keynote by our healthcare provider customer who talked about the importance of model driven security and investing in data scientists. Model driven security is the use of math and algorithms to evaluate behavior in order to make real time security control decisions. Instead of relying on humans to enter those control changes into a console, machine learning models drive automated response and orchestrate decisions. “What’s that thing that doesn’t lie?” he asked the audience. “Behavior.” Behavior based security analytics is the definition of model driven security. He told us one of the reasons he chose Gurucul was because of our deep bench of data scientists. He didn’t even realize how important that was until we got into a POC with 4 other security analytics vendors. That’s when our talent pool quickly became evident. An example of why model driven security is needed: a recent large organization had 15,000 servers taken down in under 90 seconds. There are no people in this world that can respond fast enough to mitigate those sorts of attacks. You need to be able to move at machine speed, and that is why our customers are moving to model driven security because it gives them a machine-based reaction time to critical threats. One of the cool things this particular customer has done with Gurucul is to identify a way to block select emails from leaving the environment if a user’s risk score is considered high. This is a great example of model driven security: action is taken on identified risks with no human intervention. If a user’s risk score goes up, that user can no longer send certain emails outside of the company. Our healthcare customers were constantly trying to sift through thousands of alerts per day. When they started to model specific behavior, it gave them the ability to focus on what was most important. It greatly reduced the amount of time they were spending looking through incidents that may not be risky and gave them the opportunity to focus where they needed to – on risky behavior. Our customers are driving very powerful behavior analytics use cases. You could, too. Contact us today to get started. We are pleased to announce the release of our new Fraud Analytics product. It enhances traditional fraud detection and prevention tools by providing 360 degree views of user and entity behavior. By ingesting transactional surveillance in real-time and near real-time, the product can identify and prevent potential fraudulent transactions on the fly. The platform uses advanced linking algorithms to correlate cross-channel activities related to user, account, device, location and business transactions. It provides the largest library of machine learning models which are tuned to predict and detect fraud based on risky abnormal behavior. Financial Fraud – Money laundering, credit card fraud, Identity fraud, Mortgage fraud, etc. Healthcare & Claims Fraud – Prescription fraud, claims fabrication, upcoding, unbundling, etc. E-commerce & Retail Fraud – Charge back, unauthorized discounts, unauthorized sale voiding, exceptions, returns, etc. With the deadline TOMORROW, organizations need to comply with the European Union General Data Protection Regulation. Failure to do so for all companies interfacing with any private citizen of the EU’s data will have stiff financial consequences. Are you ready? Download our white paper to understand how user and entity behavior analytics (UEBA), along with identity analytics (IdA), can address a critical component of the GDPR requirements. Our book is now available in digital form! 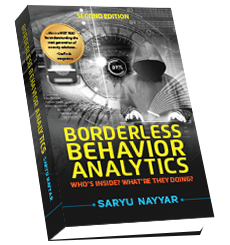 “Borderless Behavior Analytics – Second Edition: Who’s Inside? What’re They Doing?” can be now be purchased on Amazon as a Kindle edition. AWARD: Gurucul Risk Analytics Platform Recognized for Best Analytics, User and Entity Behavior Analytics (UEBA). This inaugural awards program by Business Intelligence Group identified the world’s leading companies and products that are keeping data and electronic assets safe from growing cyber threats. Gartner Security & Risk Management Summit. June 4​-7​, 2018​. National Harbor, MD. At Gartner you’ll learn about the latest threats, flexible new security architectures, governance strategies, the chief information security officer role and more. User our code to get $350 off the standard registration fee: SECSP220. RSA Conference 2018 Asia Pacific & Japan. July​ 25-27​, 2018​. Marina Bay Sands, Singapore. Gurucul is pleased to be exhibiting at the leading information security event in the APAC region. Visit us at our booth!